As all we know, Framework or web application framework (WAF) is actually a software structure that is crafted to renovate and modify dynamic web pages, web applications, and other web services. AMF is Application Management Framework. It is developed to manage several utilities and inter connections of a web application in customized way to attend customized performances. So, on the view of development, this procedure is called Custom AMF Development. The Application Development Framework or ADF and Custom AMF Development are contemporary to each other. A web application framework is employed in development of dynamic websites, web applications and web services as it reduces overhead encountered in common web development activities. This can be illustrated by the promotion of code re-use and provision of libraries in such frameworks used for database access, templating framework and session management. 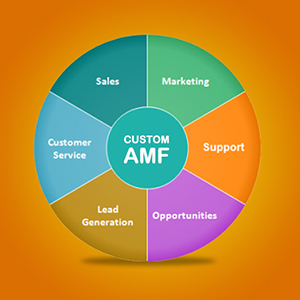 Custom AMF is developed to manage contents already developed by ADF in a customised way. The basic functions are to associate tags to custom content types, create new tags automatically, manage tags from the control panel, associate categories to custom content types, allowance to author for several categories, manage and merge tags from the control panel, manage categories from the control panel, create complex hierarchies, publishing content to certain customized conditions, etc. So, at the bottom line if any customized content management development is required, related to framework a custom AMF is required to developed. This custom AMF reduces several tasking hazards regarding development. You can find some ready attributes which helps you to manage certain fields, lower the task for certain actions. This becomes the regulatory controller of the framework used by the developer. I have developed a custom AMF named RUBIK to help in my own development works. My team is working to develop several more custom AMFs for the utility support to our team and several developers around the world. So feel free to contact us for the best services.